On reading on Cloudy Nights a few months ago about the forthcoming publication of this book, I knew that it was one that I would really like to add to my collection, especially because I am an avid collector of books about deep sky observing. I have an entire bookcase devoted to deep sky observing books and these are beginning to spill out into their surroundings! 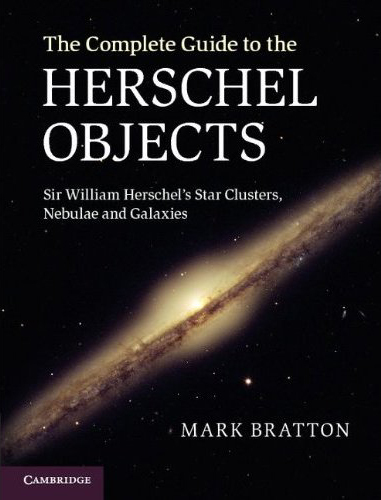 There have been some books appearing about the Herschel Objects in recent years, including The Herschel Objects and How to Observe Them by James Mullaney and Steve O’Meara’s Herschel 400 Observing Guide and this new book adds to the literature. Steve O’Meara’s book is truly excellent as a guide to finding your way around the H400 while James Mullaney’s guide is not too bad. So does this new one fit in? My copy showed up this week from Amazon. It was supposed to appear in mid-October sometime but was early, always a bonus. The book is very heavy, no surprise at nearly 600 pages thick, and is printed on good quality paper with minimal show-through. If you drop it, move your foot out of the way! The Introduction contains a description of one of William Herschel’s observing sessions as he is making discoveries of his nebulae and a quick overview of his career as an astronomer. The following part describes William’s other career as a telescope maker – his clients included King George III who was one of his first customers and, in those days, the royal seal of approval meant everything. I guess William was the Dave Kriege, David Lukehurst or Rick Singmaster of his day – although I don’t know if any of these have powerful or celebrity clients! The next couple of chapters cover deep sky astronomy before Herschel’s time and his observing methods and discoveries. These are short chapters but do give the reader an idea of the family – because it wasn’t just William, his sister Caroline assisted him and made a lot of discoveries herself, including galaxy NGC 253, and later his son John made a lot of discoveries in the Southern Hemisphere sky – behind most of the objects observed by amateurs today and these chapters are well-written, interesting and very readable. Once the historical part of the book – essential to set the background behind William Herschel’s objects – is finished with, it is on to the main part, which is the section about the objects themselves, based on Mark Bratton’s own visual observations. Firstly, though, Mark describes his observing locations, mostly in Canada, and telescopes used which is useful to put the observations into context. There is also a guide to Herschel classifications of objects which are a useful way to describe them to this day. The objects are arranged in NGC order by constellation (the Herschel numbers are also included) and are described in detail, both from Mark’s own observations and their appearance in photographs and on the DSS images. A lot of the objects have an accompanying photo and, best of all from my perspective, is the inclusion of some eyepiece impression sketches. Unfortunately, some of the photographs of the objects haven’t reproduced very well and look a bit washed out but this is a fairly minor detail, as it doesn’t affect most of the photos and doesn’t detract that much from the overall quality of the book. A bigger criticism I have relates to the sketches. There’s nothing wrong with Mark’s sketches themselves but they are a tad on the small side, in contrast to the much larger photos, and there aren’t very many of them, again when compared to the photos. As a purely visual observer, I believe a sketch is far more representative of what can be seen at the eyepiece than a photograph is, so it is rather disappointing that there are so few of them and that the ones there are a bit small, particularly as the book is written by a visual observer. Space constraints probably meant that the sketches had to be reproduced smaller but I think a few photos could have been sacrificed to make way for more and larger sketches. However, as this is a guide to deep sky objects, rather than a guide to visual observing of the objects per se, this is probably a minority view. The descriptions are good, detailed and very helpful in giving an idea of what to expect when looking through the eyepiece at the objects. However, I would have liked an idea of what scope and magnifications Mark was using; each sketch has a caption with scope size and magnification but the descriptions do not, which I find a little odd, but this is a fairly minor criticism. Criticisms aside, as a guide to the Herschel objects this book is excellent. I would definitely recommend it to all deep sky observers and those interested in the historical aspect of deep sky observing, particularly William Herschel’s contribution. If you’re a serious deep sky observer who has advanced beyond the Messiers and are doing the Herschel Objects (the Herschel 400 is often viewed as the ‘next step’), then this book is for you. However, due to its quality and the cost of it (£45/$60) I would not use it as an eyepiece observing guide, thus exposing it to dew, being dropped into mud or any of the other fates that often befall observing guides used at the eyepiece and it would be a shame to spoil it. It’s one for cloudy nights, bedtime reading and planning observing sessions. Highly recommended.